Have you seen our custom mirrors yet ? You can easily created little mirrors for your handbag or beauty kit. A round mirror that you can customize yourself so that not one other person has the same! 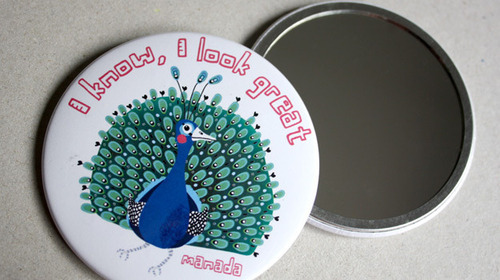 This mirror was designed by Manada but I am sure you can do it just as well. Do you have any ideas yet ? There are so many possiblities to create an unique mirror. You could put the photo of a night out with the girls, a funny drawing made by the kids or a phrase that reminds you of a special occasion.